GR PR MARTIN'S PR ABICASA PEER GYNT. 24n. 14-02-08. 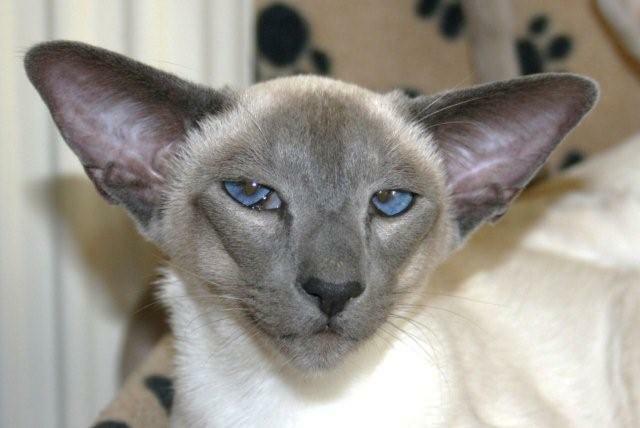 Caramel Point Siamese, not an overly large chap but beautifully stylish & with an innate knowledge of how to sell it. Beautifully even lines to his medium length wedge with a pleasing balanced triangular appearance, the lines even, excellent profile, good chin, bite fraction over. Ears large & beautifully set, wide flared complementary open base. Wonderful expression of superiority to the eyes, deep blue, the shape & set both so typically oriental. Elegant neckline, body not overly large but good length & very stylish, slender limbs, neat oval paws, good length fine whip tail. His coat was beautifully prepared & very sleek, short & close lying. Some tonal body shading his Blue based Caramel points, well matched, a dark sludgy blue with brown overtones creating a Taupe tone. His condition was super & he was a very confident lad who used what he had to show himself to best advantage.